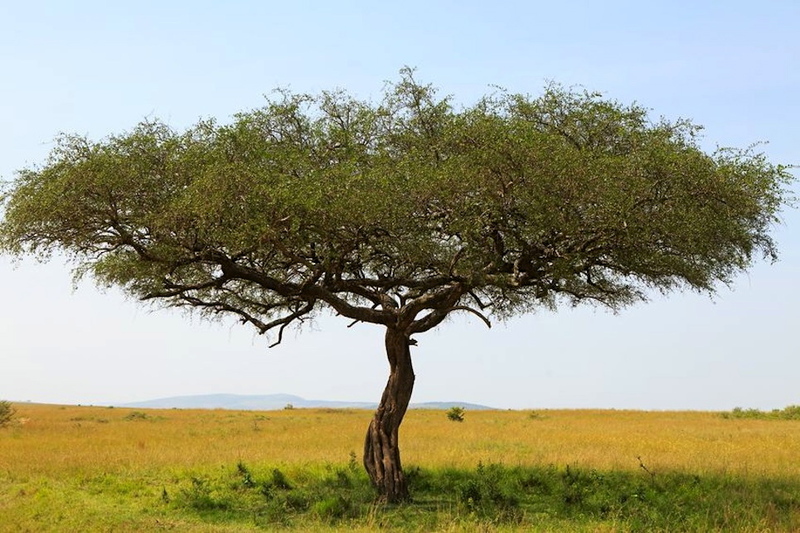 Flat-topped and set against a backdrop of golden grass, the Acacia tortilis is the classic tree of the African savanna –– and in our opinion, one of the coolest tree ever. Why so cool? First, they have a unique shape, which they get from the savanna’s resident barber, the giraffe, who is responsible for turning the trees into living umbrellas. Second, they can survive extreme heat and annual rainfall ranging from as little as one inch to as much as 40+ inches. Third, they have an ingenious defense system in the form of long, sharp thorns that keep most of the neighborhood’s hungry leaf shoppers from shopping. So how do the giraffes escape the thorns? They’re equipped with a tough eighteen-inch-long tongue that they use to get to the tastiest acacia leaves. A tongue perfectly suited for nibbling, pruning and shaping. A few fascinating facts about acacias: there are about 800 species worldwide; the Acacia tortilis is known as the umbrella thorn tree; their thorns are two to three inches long; the Acacia tortilis’ umbrella-shaped crown enables it to capture the maximum sunlight, with the smallest of leaves; elephants help to control acacia numbers by knocking trees over and eating them.